If Moero Chronicle could be considered the Moe (cute) of dungeon crawlers, then Mary Skelter is going to takes the crown as the macabre of the genre. 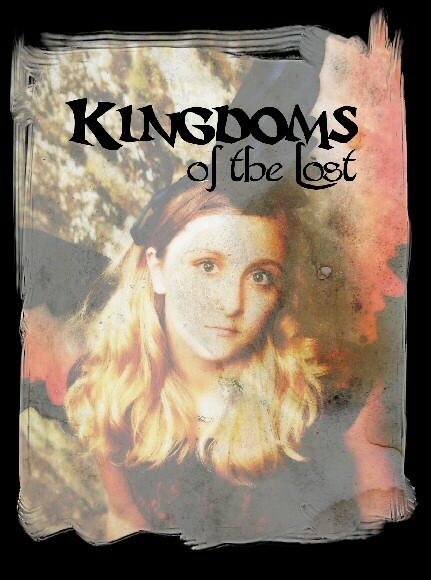 Cast down into the depths of a place known only as jail, Jack, Alice and Red Riding Hood are going to need some help if they are going to make it back to the surface and see what no one has observed in generations: the sun. There are a few similarities between Moero and Mary, though the ideas behind the later will most likely sit better with some than others. Both use the idea of a main protagonist leading a party of powerful women while also having their own actions that are not directly combat related. Compared to the previous however, Jack isn't some hormonal libido machine but instead a source of calm and peace for those known as Blood Maidens. More powerful than the average human these women possess the ability to fight what are known as Machen and Nightmares which act as Jail's enforcement. The drawback to this power is that if they get too splattered with Machen blood they can go insane and enter what is known as Skelter mode. Once to this point there use to be no going back and they would basically be berserked until the end of their life. Enter Jack whose blood can bring these woman back to normal through less than normal means. These women aren't vampires so Jack won't be covered in fang marks. Instead, after originally having to cut himself he obtains a gun that allows him to shoot his blood and keep the wound it causes clean of infection as well as help the coagulation process for his own healing. It sounds a bit on the disgusting side but when leveraged against losing one’s mind and hurting those closest to them, it seems like a small price to pay. Now while there are no visually overt sexual tones like a lot of Compile Heart's work, the dialog and some of the dungeon crawling features are full of them making this an adult experience but not a lewd one. Jail, the massive dungeon that our cast finds themselves within is a living breathing organism that gets hungry, sleepy and has its own libido to worry about. So while you won't be worrying about Jack's you will be worrying about Jail’s. 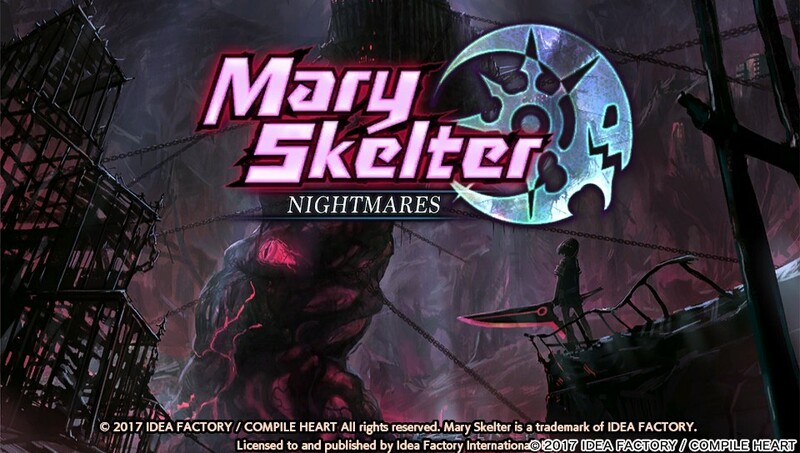 This alone starts to differentiate Mary Skelter from the rest. The Dungeon isn’t some ancient relic that appeared. It isn’t laden with traps “just because”. Instead it’s a living and breathing organism made up of the stuff of nightmares in which the traps can be viewed as its immune system in order to keep itself safe. These traps come in many different forms but unlike a lot of other dungeon crawlers you’ll have to be constantly on your toes as just because the basics have you moving one step at a time, it doesn’t mean that the traps will. Those run in realtime. 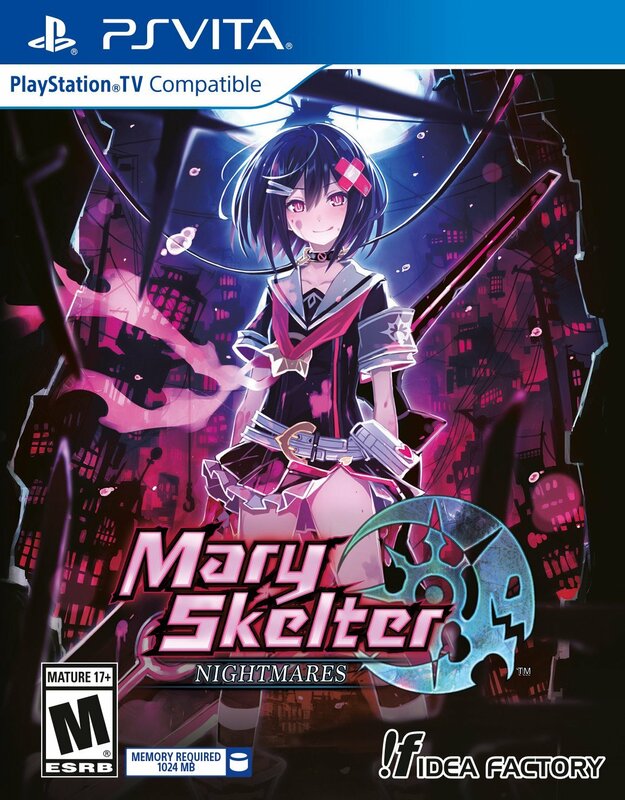 After even a dozen or so hours Mary Skelter continued to surprise me with how well it was designed. The Dungeons are seriously massive which makes the appreciation of teleportation points on the same floor a blessing. Unlike some others, the twists and the turns feel natural as everything about this place feels massive though you may not realize it in the beginning. Each Blood Maiden that comes into the group holds an ability that is essential to moving forward in the various dungeons. Alice “from wonderland” for example can create a Rabbit Hole that allows for either a Save Point to be created or a portal back to town if things are getting a bit rough and both Hit Points and Special Ability points are low. Red Riding Hood has the ability to cut objects such as wires, membrane or boxes in order to move forward. These passageway will not be seen on the map so until they are taken out it gives one more reason to re-explore an area after another member has been added. Following on that train of thought the puzzles continue to get more complicated and require a bit more effort on the party’s side. Not everything will always be easy and exploring every nook and cranny in order to move forward is a must. Sleeping Beauty for example can help with this by loosing arrows to a faraway switch while Snow White will simply place a poison bomb (don’t stay close) in order to blow something like a tree out of the way. 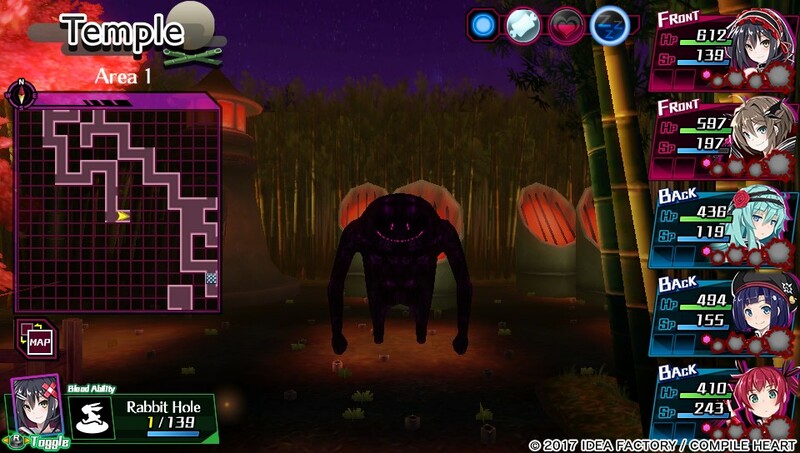 Others like the Miko Kaguya will be able to form a barrier that allows the party to move through traps in order to continue forward because some gouts of flame are simply too much to survive. Combine these puzzle elements with other traps such as raising spikes from the floor and descending swords from beings stuck in the walls and there’s plenty to look out for. This gives all the more reason to thoroughly explore to find the waypoints in order to teleport back to this location faster as Alice’s Rabbit Hole is a one way trip home and you’ll have to walk back to these far points otherwise. Thankfully the map is both auto-generated and there’s an option to auto-walk which is pretty good unless it has to go through locked doors. Then you’ll have to auto-walk to the switches and then continue the passageway forward. In the midsts of all of this is a very heavy combat system which I found to be very well designed. Each turn order is based off of speed unlike what originally seems like Jack goes first. I thought it was the case until hours in when Sleeping Beauty of all people with her epic archery and gunnery skills is so quick that she just about always starts the battle. From there the system takes the basic elements of a dungeon crawler with Hit Points, Special Ability Points, Attacking and Defending. 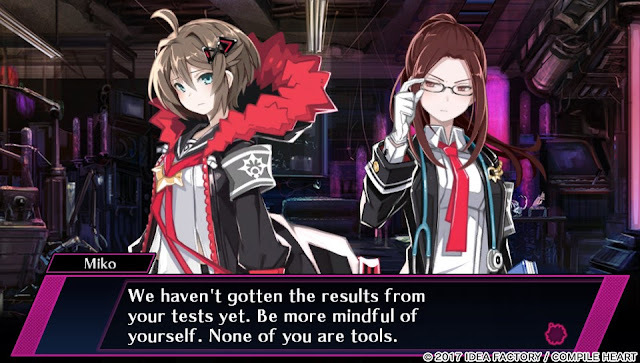 From there however is Mary Skelter’s Blood system which simply adds to it all instead of taking anything away like the previous libido system. As the girls get blood splattered the chances of going Skelter is increased as the Machen blood is essentially toxic and can corrupt them. To keep them from this Jack is going to have to use his “weapon” in order to shoot blood at each party member in order to keep the corruption level down. Because he’s using his own blood Jack will need to take turns in order to produce more otherwise it’s possible for him to get stunned and knocked out for a few turns just as easily as if he puts himself in harm’s way to defend one of the girls if their hit points get too low. Skeltering however can happen even if you micromanage the blood cleaning. The corruption can increase in a heartbeat if a party member takes multiple hits in a row, a critical hit or simply destroys enemies very quickly alongside the other two. If this happens then all bets are off and they’ll hit whoever they deem to be a good target. If it happens Jack’s other ability is to try to bring them back to sanity. 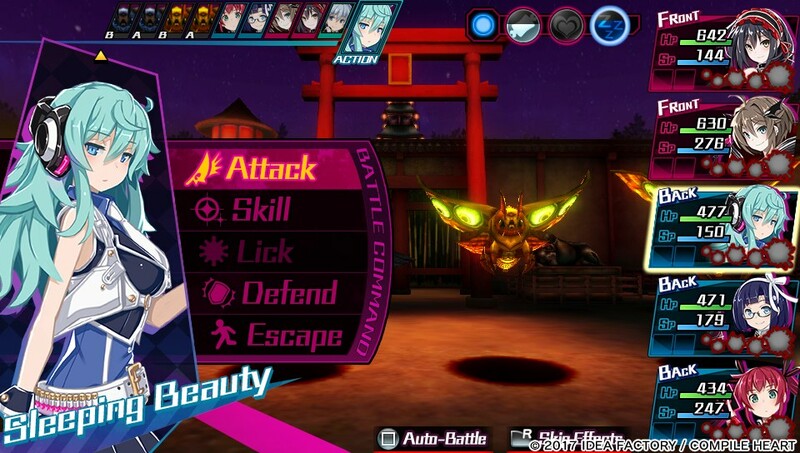 If the battle ends Jack will do this automatically but generally it’s a good idea to do this within battle in order to save the rest of your party. Now while Skeltering is always a possibility Massacre Mode is more than welcomed. Each party member has a blood guage that once filled will activate Massacre Mode. They get stronger, tougher and obtain other abilities that are not normally available. It’s worth allowing them to reach this point as long as their corruption levels are not high. If they are then you’re running the danger of Skelter Mode which as previously stated is not pleasant! 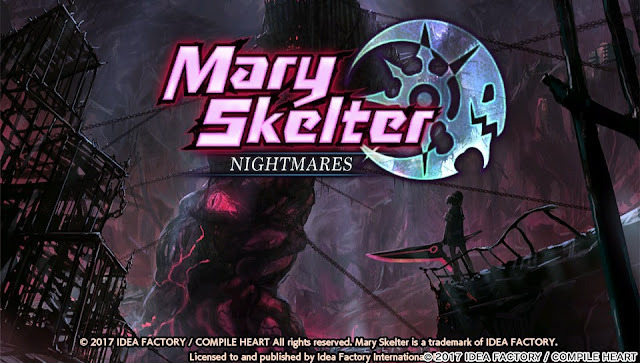 So how could you simply avoid the Skelter Mode all together if you’re not certain? This is where Compile Hearts brings in what it does best. In the middle of battle each girl can lick the blood off of another as long as the gauge is sixty percent filled. This comes with a quick animation of blushing from the one who is currently being licked which does not happen with Auto-Battling is on (just in case you are playing this on a bus!). Now while the suggestiveness of the action lies just underneath it does come with a gameplay mechanic which makes it worth it. Each character can trigger an effect when the blood is licked off of them which can turn the tide or at least stem the bleeding in tougher boss fights against the nightmares. Adding to this flavor are the weapon, item and class upgrade systems. The reason that the three are thrown in together is that they all require gems of the various blood types in order to perform anything. -A A A+ the Bs and the Os are all available to be picked up either through harvest points or through various enemy types. The stronger the weapon the more that is going to be required. 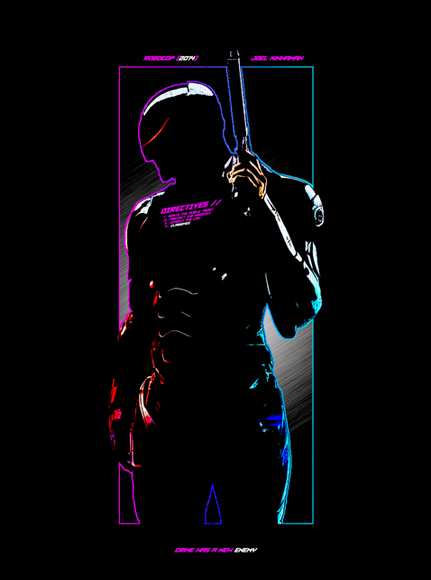 Different weapons require different blood types and changing classes is no exception and even requires a substantial amount so you generally won’t be changing every party member at the same time. Changing classes other than changing a character’s physical appearance will also change how her stats become allocated on level ups. While I would love to say figuring these out as you go forward is key to making a proper and informed choice, you basically get silhouettes of any unlocked classes and a vague description. If you really want to try them out then you’ll need to class change which requires points that are gained by leveling up to certain values. If you feel like you may have made the wrong choice then points for leveling down also become available but cost a good deal of blood gems so that either will not be happening earlier on in the adventure. That said, the option is there and it allows for bonuses to be granted for leveling which really allows for character customizations for any situation. Finally one of the last features really fits the profile and I would have honestly been surprised otherwise, is a purging “minigame” in which Jack rubs off any of the Machen blood that is left over after going back to town. Thirty seconds are granted to clean the blood off of the chosen Blood Maiden while they are wearing nothing but a swimsuit. Doing this grants them stat boosts until the next time that they fall into battle or the party comes back to town. This only needs to be done once before the option to skip the process is granted keeping it playing on the bus friendly. Not every Blood Maiden can go through this process at the same time as it relies on a percentage of Jack’s blood meaning you really need to choose who should be granted the bonuses or who needs them in order to survive a little easier. To tie everything together, as previously stated Jail is a living and breathing entity and all of the above comes full circle to that. As the party hunts Machen and Nightmares the bloodlust and the blood will increase the Jail's hunter. Licking the blood from one another or finding emotion points on the map will increase Jail's libido. Doing nothing at all but walking and exploring will increase Jail's sleepiness. 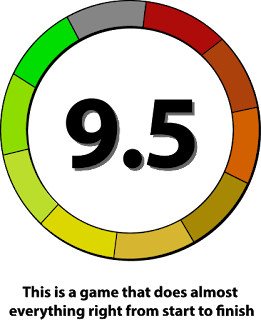 All three of these have their own separate meters that can also increase or decrease depending on Jail's own mood. Filling up any of these meters either inside or outside of battle is beneficial and it'll prompt a bonus wheel. The bonuses are different both inside and out but all are worth it so capitalizing on Jail's mood is well worth it. In an aside to how the game runs and how it plays out it really is the little things that make what is already an amazing experience even better. With all the blood flying around especially on a critical hit or taking out an enemy with a weakness you'll see the blood on the walls and the floor of where you're standing after battle. The environments never feel stale but alive with all the little additions such as creepy sentry eyes, moving bits and pieces, beating hearts that can be slashed open for items. 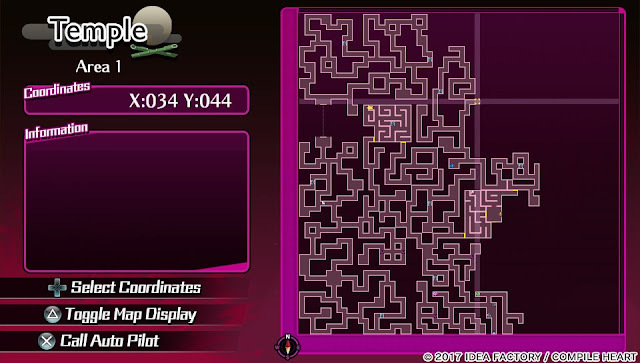 All of these little inclusions only made it better and easy to spend hours at a time inside of these labyrinths either on the Vita's tiny screen or on the PSTV with whatever it was hooked up to. Mary Skelter: Nightmares is one of the best Dungeon Crawling RPGs that I’ve played in a very long time and it does everything right. The blood gem currency for equipment and classes, the dungeon progression, the fairy tale characters and their special abilities as well as Jack’s blood gun to keep them from going berserk. Everything provides a well balanced system that doesn’t get old and only makes you want to keep moving forward. 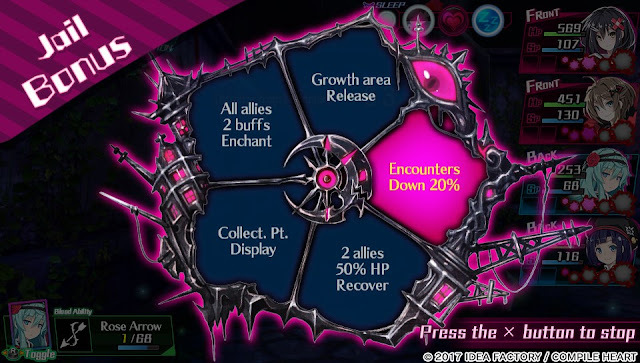 Even as the difficulty ramps up into the new dungeons never does Mary Skelter become obscenely hard or unfair, it just means that auto-battle needs to come off and you need to take control on your party before you game over.